I have a confession to make: I’m a hummus addict. For breakfast, for lunch, for snacks, for dinner, and most often for a 4am post-drinking snack. It’s salty, it’s creamy, it’s garlicky, and you get to eat it with pockety pita bread (don’t eat it with flatbread, please. Ugh. Pocket pita only. Preferably locally made). 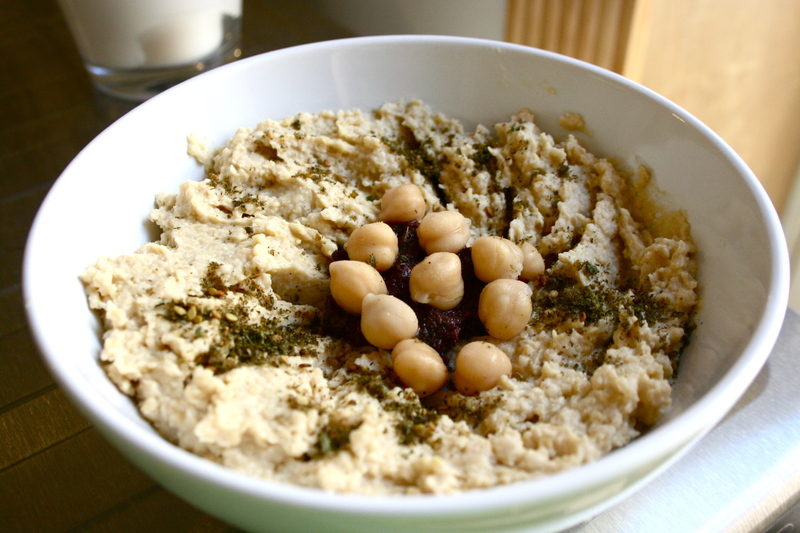 One — store-bought hummus is expensive. Three — store-bought hummus only comes in tiny containers. I need lots of hummus. I like a 5:1 ratio of hummus to pita. That means that I can finish of a store-bought container of hummus in a day. Pricey. Therefore, after researching every corner of the internet, I have come up with a brilliant, garlicky, flavorful and affordable homemade recipe for hummus. It cost about the same amount of money as a small thing of store-bought hummus, and made about twice as much. Of course, considering my big bowl of it is halfway gone already, I may have a new problem: this hummus is so good I just can’t stop eating it. 1. Cut about 1/8” off the top of the head of garlic. 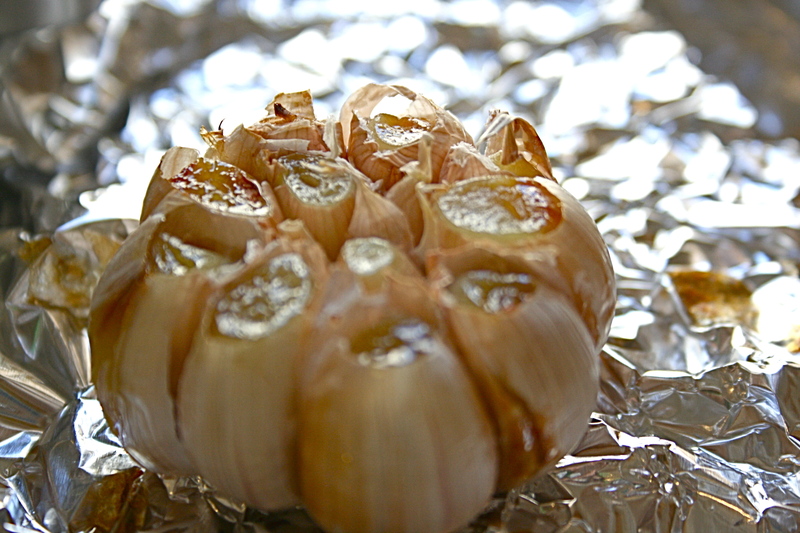 Wrap the head of garlic in foil, then roast in a 425-degree oven for 40 minutes. The head of garlic, after roasting for 40 minutes. 2. When it’s done, let the garlic cool for a few minutes until you can pull the roasted bits out of the skin and put them in your food processor (this is an essential tool: don’t try to do this with a blender. It will be messy). 3. Add the other four large cloves. Blend these together with the food processor. 4. Add the tahini, sea salt, lemon juice, olive oil, and reserved chickpea juice. Blend. 5. Add the can of chickpeas. Blend to desired consistency. 6. IMPORTANT: taste. Determine if you need more tahini, salt, lemon, olive oil, or chickpea juice. This is definitely a personal preference thing. I ended up adding more tahini and olive oil. 7. Spoon into a bowl, and top with a scoop of tapenade, some chickpeas, liberal sprinkles of za’atar, and some more olive oil. Enjoy with some warm pita bread, carrots, celery (or other vegetables), spread on your sandwich, or with a spoon after you finish your third martini. A close-up of the toppings. 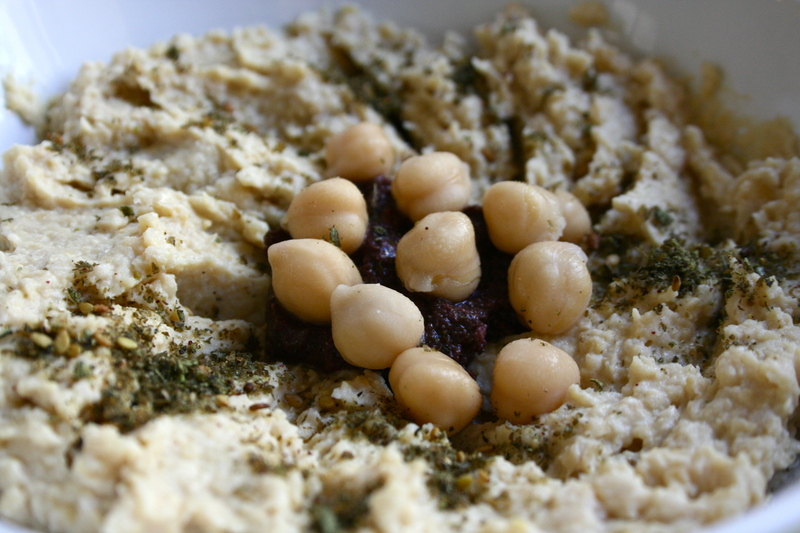 The tapenade is in the center, topped with a few chickpeas, and surrounded by za’atar. This entry was posted in Breakfast, Comfort Food, Dinner, Hangover Food, Healthy Food, Lunch, Snack, Spicy and tagged Featured, garlicky hummus, garlicky snack, healthy snack, homemade hummus, hummus, roasted garlic hummus, salty snack. Bookmark the permalink. Wantttttt.Scad’s hummus is very lacking.